During the time of writing our latest post about the new Hyundai Ioniq and a series of teaser images released by the automaker earlier today, we have gotten our hands on some highly exclusive drivetrain specifications. Thanks to our reader from Korea, we can now show you the official Hyundai Ioniq hybrid electric vehicle (HEV) fuel economy figures, as well as several other interesting details. In South Korea, where the Ioniq is already available for pre-order, consumers can choose between two slightly different models. They both feature a hybrid electric drivetrain with a 1,6L GDI four-cylinder engine but they achieve different fuel economy ratings. The base Ioniq model, fitted with smaller sized tires (195/65 R15) achieves up to 22.5km/l (53 MPG US), while the range-topping model riding on 225/45 R17 tires achieves 20.2km/l or 48 MPG US. 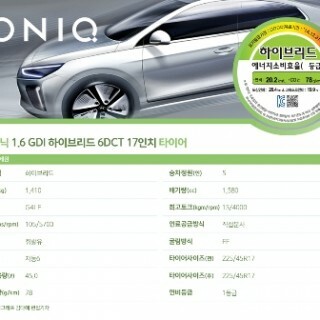 To find more details about the Ioniq MPG figures (Korean market), take a closer look at the fuel economy stickers here.